‘Museum Goes for a Pint’ was an eight-week project running between October and December 2013, as a spin-off from the ‘Goes To Town’ closure project. 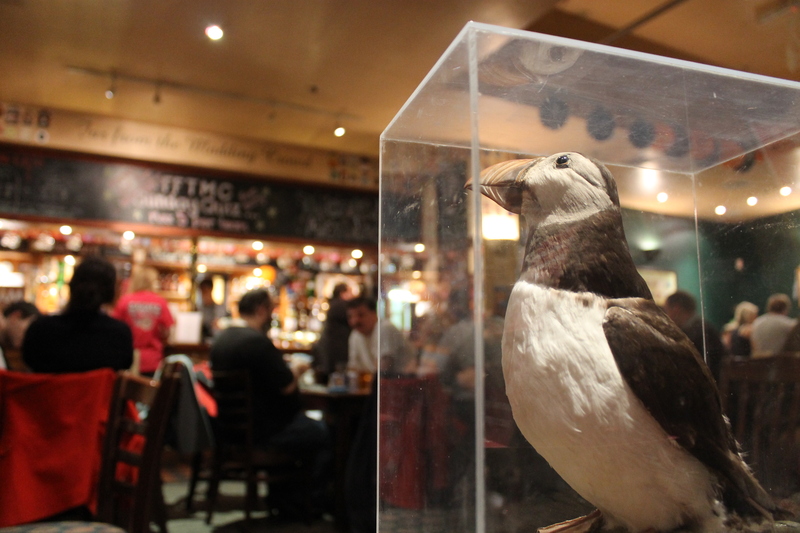 The Education team popped up in eight different pubs to host a natural history-themed pub quiz, with real specimens from the collections. The Museum was closed throughout 2013 for extensive work on the roof. During this time, the Education team explored innovative ways of engaging with audiences who could no longer visit the building itself. As a way to reach young adults, particularly those who have not visited the Museum before, Education staff approached pubs in Oxford, to discuss taking part in their weekly pub quiz, or running a special one-off event. Eight pubs in the city centre and east Oxford signed up to take part. An evaluation conducted for the Oxford University Museums showed a low visitor rate for people aged 16 to 24 compared to other age groups. It also revealed a desire for the public to see museums engaged in specific social events. Goes for a Pint was intended to address these two issues. 38% of all participants had never visited the Museum before. Each event was run by one Museum staff member, supported by three or four volunteers. The team all wore bright pink branded t-shirts and handed out specially designed beer mats to promote future events. Volunteers gave out sheets and pencils, but also engaged the public with real Museum specimens that they could handle as part of a Mystery Object round. This was sometimes done on a static stall, but often they carried the specimens around for each team to see. Feedback from the quizzes showed that we were successful in presenting the museum in a light-hearted, playful way. The majority of participants were keen to visit in the future and wanted more events of this style. As a result, upon re-opening in February 2014, we hosted a late-night event aimed at students, which continued the theme of the pub quiz. A bar and a quiz trail around the museum, as well as picture rounds and film clips, recreated this familiar experience, in a special setting. In total, 2,590 people attended, including 1,813 who were bracketed as ‘young people’. Hosting a round or two alongside a normal pub quiz attracts a far wider audience, and also helped engender a partnership between the particular establishment and the Museum. Some Museum staff sometimes took part in the quizzes in their leisure time. This made balancing the difficulty level of the quiz tricky when writing the questions. In the future, we would clarify with staff ahead of the events that this is intended for the public rather than subject specialists! T-shirts were fantastic for highlighting the staff and volunteers involved. "It’s good to see things out of glass cases – sometimes you forget they are real." Want to view other Oxford University Museum of Natural History case studies?